Discover history, canals and landmark architecture in vibrant Amsterdam on this private 3-hour city walking tour. Accompanied by your own informative guide, stroll around the heart of the charming Dutch capital and see highlights such as Dam Square and the De Wallen red light district. 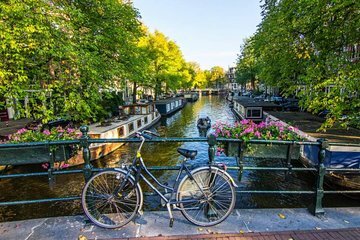 Learn about Amsterdam’s World War II history, stop to see the Anne Frank House, and amble through the delightful 17th-century canal district. As you explore, gain insight into the city’s culture and history from your guide, and break for a refreshing drink along the way. It has been an amazing tour with our our guide Tony, who was very friendly and knowledgeable.We only had one day in Amsterdam so we wanted to see as much as possible, Tony made that possible for us! We had a great introduction of Amsterdam and we never could have seen so much. We saw a lot of different sights with this tour: the Red Light District, House of Anne Frank, the flower market, Rembrandt square and so much more. Thanks a lot for this wonderful experience. We wish we could have stayed longer in Amsterdam. Highly recommended. Tony did a great job, he was very informative and accommodating to our needs we needed to change times for another reservation we had. I'd recommend this tour. We had a fill in guide who did not seem to have much experience. We did get to see everything listed in the ad, but not as much as I would have liked in a 3 hour tour. Many times it felt like we were just walking in circles. We did get a lot of history and explanations of what we saw, so it was helpful and better than just walking around by ourselves. It was a nice introduction to the city. It made us comfortable in the city and we were able to complete our own tour the next day. The guide was not able to offer any side advice or give us any advantages or inside information on how to get into places he told us to just forget about trying to get into the Anne Frank house if we didn't already have tickets - he couldn't offer any advice as to a better time to try and get in, etc Not the best tour we've ever had, but not the worst ,either.